The chickens have landed! I repeat, the chickens are in the coop! Hello there, chickadees! 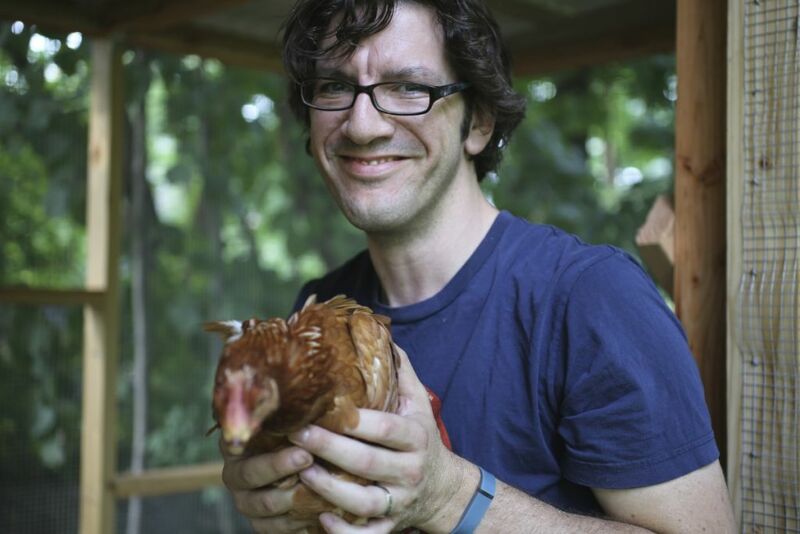 You’ve probably gathered that I’m not quite as prolific as m’wife when it comes to updating the blog, but I think it’s about time – no, past time – for an update on how the chicken coop is going. Well, it’s done. We have chickens. All those things are true. I found a plan online, a plan that was detailed and had lots of pictures (quite important for an idiot like me with no knowledge of power tools), I ordered the lumber and hardware parts, and hove at it. There was sawing. Quite a lot of sawing. There was the judicious application of nail and screw, along with a fair number of brackets, and a great deal of hardware cloth, wrapped around and sunk a foot into the ground. There is a brace, ‘cos it’s a bit wonky. 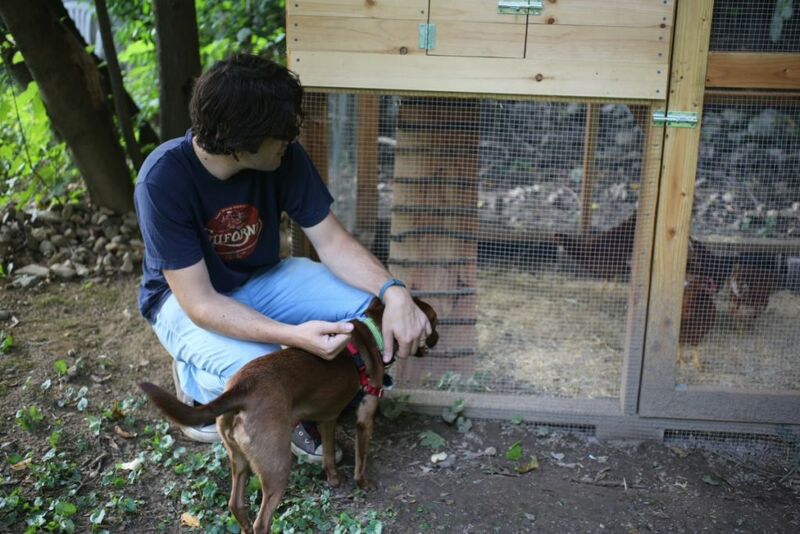 Essentially, it’s a walk-in coop consisting of a framed shell, roofed with corrugated vinyl, and enclosed on one side with interior plywood and exterior siding, to form the henhouse. Once the frame was together, our friends Karen and Tom helped us position it down in a corner of the yard, and I built up the frame, roof, netting and henhouse a step at a time when I had a few hours in the day. 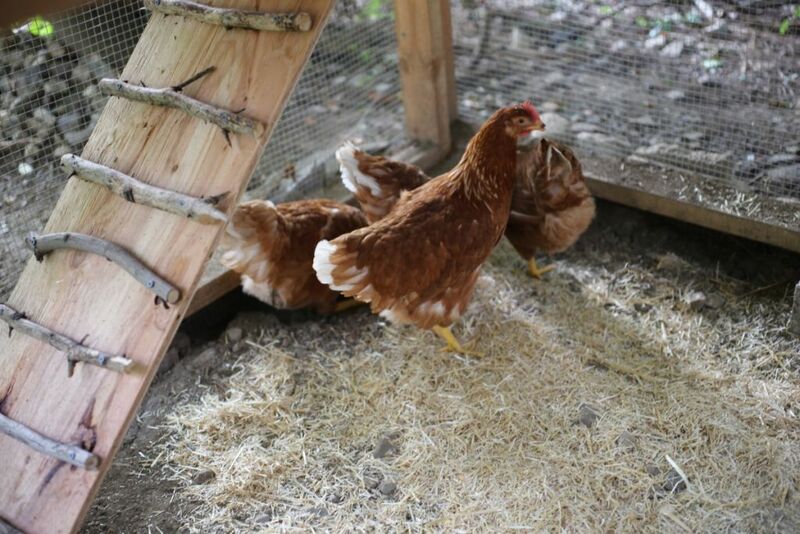 Last weekend I finished the plywood nesting boxes and interior walls, and today we drove up to Saugerties and handed a farmer some cash money in exchange for four chickens. Yes! We picked these four lovely ladies up today. 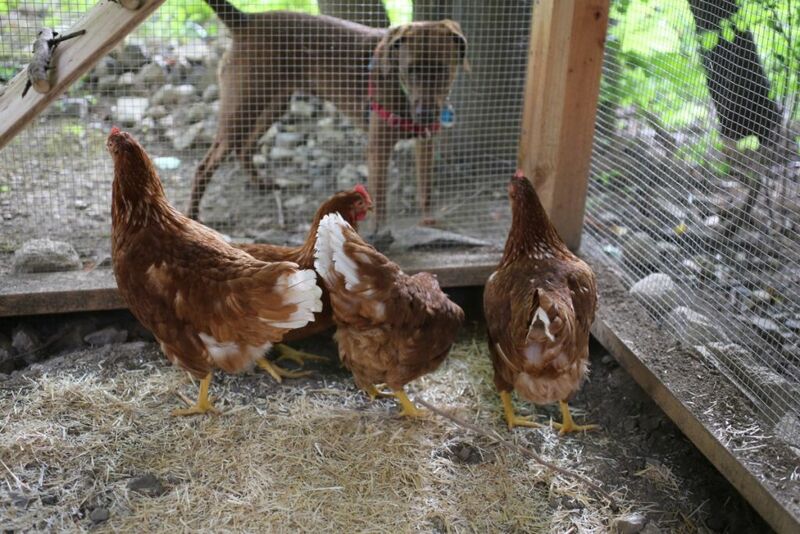 Seriously, can you believe we actually have chickens? In our yard? I’m agog. AGOG, I say! I can’t wait to meet my nieces- Cacciatore, Egg, Cutlet & Heather Anne!! How’d you know their names already? Come here and hug them!!! Did you just post a recipe for chicken and then a post about your new chickens? great. Yes. Yes we did. AND I’D DO IT AGAIN! Ahhhhhh hah haaaaaah! We want videos of the whole family doing the CHICKEN DANCE! Congrats. Do I have to bring a housewarming gift for these chickens? Yes, they like rotten blueberries, stale bread, and sunflower seeds. From the Martha Stewart collection at JCP.